Legal Marketing Reports - How Effective is Your SEO & PPC? It’s one of our Ten Commandments and we live it out: Speak in business terms, not technical jargon. Whether we are reporting on analytics or ads, our goal is to help you understand the motives and plans behind your legal marketing efforts. Pop Quiz: How many of the following questions can you answer about your law firms marketing investment? What advertising channel delivers the lowest cost per lead for your law firm? Cost per client? Is your law firm’s organic traffic holding steady? Going up? Dropping? What did your advertising & marketing agency do for you last month? What do they plan on doing next month? If you’re spending money on Advertising, is it delivering results? How many form fills did you get from your website this month? Phone calls? What pages are driving traffic and form fills for your firm? It’s time for your law firm to start thinking about your advertising and marketing as an investment, rather than a cost. The first step is to have a level of reporting and tracking infrastructure that makes sense for your level of investment. Standard Reporting – Our Standard Reports are automated reports delivered monthly directly to your inbox. They include all the information you need to make educated decisions about your marketing investments. 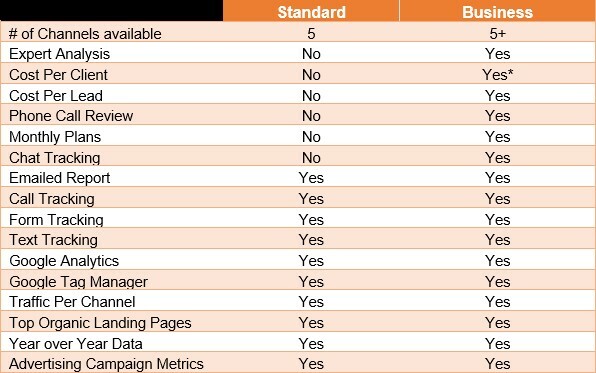 Standard Reporting includes information from Organic (SEO), Paid Search, Direct, Referral, and Social channels. Great for solo attorneys who have more time than money. Business Reporting – Our Business Reports build upon our Standard Reports and have expert analysis behind the numbers. With the help of your firm’s Account Executive, we will strive to connect the dots from leads to clients. It includes expert analysis via a phone conversation about what the numbers mean for your business and what we’re doing to improve them. Business Reporting includes information from Organic (SEO), Paid Search, Direct, Referral, and Social channels. Additional marketing channels can be added onto Business Reports! Recommended for any attorney or firm with a monthly marketing budget greater than $2,000 a month. Every employee at Mockingbird is trained on what we report on and, more importantly, why we report on it. Seriously – even our Executive Assistant understands this stuff. We leverage, BUT YOU OWN, a variety of tools including Google Tag Manager, Google Analytics, Call Rail and a robust account setup process that makes sure we are reporting on real, accurate and verifiable numbers. We don’t hide behind things like ranking reports, Impressions, CPCs, and traffic. We explain their importance and ultimately care about the channels that are bringing in actual business to your law firm! Refreshing, isn’t it? *Cost Per Client is dependent on your firm’s intake process and ability to track and export client data. This is not something we can provide without working directly with your intake specialists/front desk!